Everyone loves Christmas. 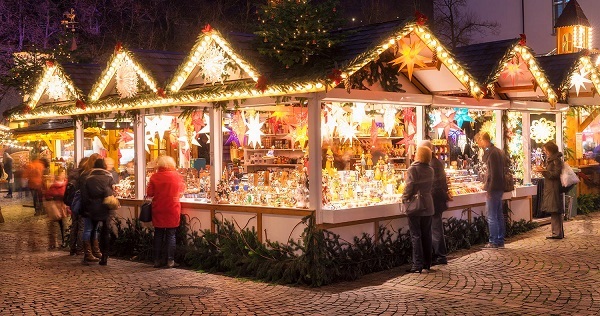 Christmas markets are a big part of getting into the spirit and if you want to make this the year you go visit one you should start planning now. And DoHop want to help but you know you totally can just organise everything online 😉 However they have helpfully put together this amazing list *AND* if you do your booking around now it should at least be cheaper than leaving it until you see everyone posting their trips around to various Christmas markets on Facebook and think ‘oh ya – I wanted to do that’. The home of over 60 Christmas markets, from the middle of november to end of december every year, Berlin has to be on this list. With so many great markets available, there is certainly something for everyone. Our absolute favorite market is the one at Charlottenburg Palace. The scenery is absolutely wonderful, with the palace being lit up by beautiful lights. The market has a great mixture of art crafts and food and drinks and is sure to fill your heart with Christmas spirit. 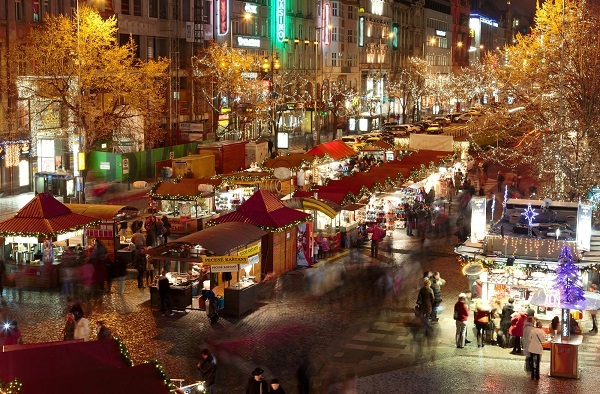 Stuttgart’s inner city hosts the city’s Christmas market, or Weihnachtmarkt, which has been a tradition for over 300 years. First mentioned in documentation dated as far back as 1692, this market is full of history. As you smell the toasted almonds, taste traditional ginger bread, and admire all the decorations, the historical city of Stuttgart will easily fill you with Christmas spirit. Shop for Christmas tree decorations, toys, woodcraft, candles, or even lambskin at this charming market. This is a family friendly market with a dedicated area for the children, called Kinderland, and a miniature railway with real steam. With millions of Christmas lights lighting up the area, Liseberg Christmas market glows with the joy of Christmas. Choose between homemade sweets, roasted almonds, hot chocolate and other delicacies for the Christmas table and find that special Christmas gift. You can even take a journey into the Christmas of the Middle Age. Remember to visit the arts and crafts area for some amazing Scandinavian designs. 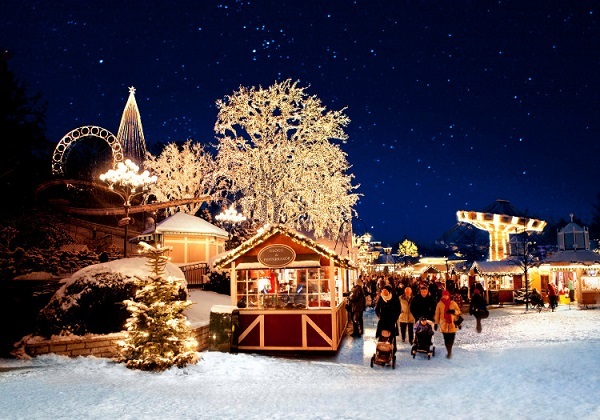 Liseberg Christmas market is Sweden’s biggest and most atmospheric Christmas market. How to get there: Through Landvetter airport (GOT), 20 min (25 km) away from Gothenburg. In Lille, the historical city located in Northern France, you will find one of Europe’s best Christmas markets. 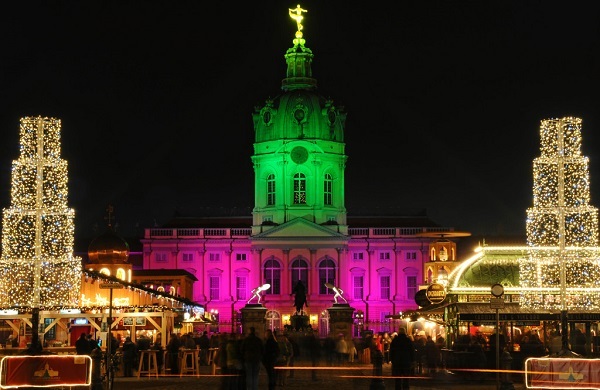 Within a period of one month, you can enjoy everything a good Christmas market should offer. Here, you will find a real winter wonderland with regular visit from Father Christmas. Take a trip in the 50 meter high Ferris Wheel with a fantastic view over the market and the whole city. At the same time, enjoy the sounds of Christmas carols fill the air. How to get there: Through Lille Airport (LIL), only 15 min drive to the city center. 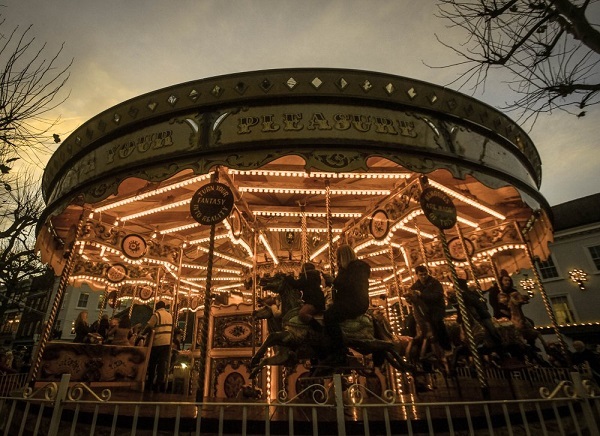 York’s St. Nicholas Fayre is one of UK’s favorite Christmas markets. Get into a festive spirit and pick up some perfect Christmas gifts for your loved ones back home.There, you will find entertainers, arts and crafts, and even some tasty treats with some hot mulled wine. End your wonderful visit to the market with a Christmas concert in the beautiful, historical Minster. How to get there: The closest airport to York is Leed Bradford international airport (LBA), about one hour drive to York. A traditional old town Christmas market in the town hall square. Since 1441, the Christmas tree has been set up in the town hall square, making it one of the earliest evidence of decorated trees for the Yuletide season. In fact, it was the first Christmas tree ever put on display in Europe. Even though the market itself does not have the longest history, or only since 1991, you can feel the spirit of this old city’s Christmas tradition. Take your time browsing the wooden stalls, where you will find wooden Christmas decorations, hand-knitted jumpers, and other arts and crafts. If that’s not enough, you can warm up with some mulled wine, or glögi as they call it. Prague hosts one of Europe’s most popular Christmas markets, located on the Old Town Square. Visitors come from all over the world to experience the prettiest and the busiest Christmas market in Prague. The market offers and celebrates traditional Czech handcraft and is characterized by its beautiful Christmas tree, surrounded by the wooden stalls. There, you will find a lot of unique products, such as Christmas ornaments, holiday decorations, some traditional Czech sweets, clothes, and handmade wooden toys. At the stage by the Christmas tree, there will be Christmas concerts and short plays. 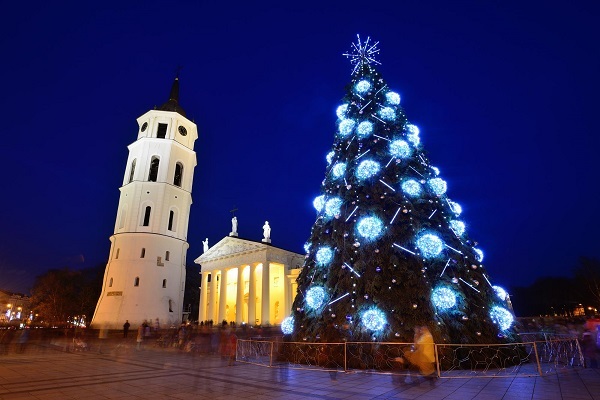 Vilnius, the capital of Lithuania, hosts one of the more recent Christmas markets. With three main locations, you can enjoy a 3D fairy-tale “Christmas Dream” at the Cathedral square, check out international Christmas charity fair at the city hall square, and admire the playing fountains and carousels at the Bernadini Garden. 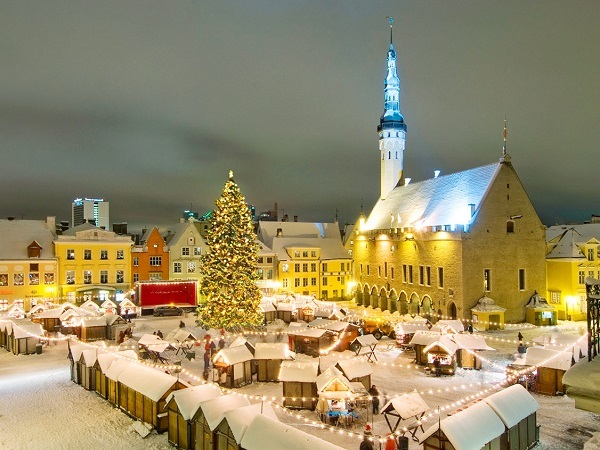 If you are not a fan of big crowds, the Vilnius Christmas market is the right market for you. With beautiful decorations all around the city, you can also buy some traditional Lithuanian handcraft, cakes, and pastries. How to get there: Through Vilnius International airport which, is only 10 min. drive from the city center. Strasbourg hosts one of the oldest Christmas markets in Europe. It was first held in 1570 and now has over 300 stalls, at 11 different locations, in the city center. The main area is around the fabulous Gothic Cathedral, where you will find authentic Alsatian Christmas decorations with beautiful arts and crafts, food and hot beverages. Enjoy a number of different events, concerts and exhibitions, which really adds to the Christmas spirit of the town. London hosts many different Christmas markets all around the city. But it’s safe to say that Covent Garden is one of a kind. During Christmas time, it is truly one of the most magical areas within London. The decorating begins at the beginning of November and over the next 2 months, the garden is decorated with 150.000 sparkling pealights and a giant silver reindeer. You will find the market In the Covent Garden Piazza, hosting around 40 stalls that sell a variety of quality goods. You can expect to find antiques, arts and crafts, pictures, and clothing. It is the perfect place to find special Christmas gifts. I love a good Christmas market! I went to Hamburg a few years ago which was magical, apart from the “adult” market with a tent for the strippers. I was just thinking about Christmas Markets so how funny that I just come across your post. I am desperate to go to the Berlin one. I know – I was too and so I saw that press release come through on a service with no sales message at all and thought – that’ll do nicely thank you! This post makes me feel all Christmassy like I used to when I was a child! I’d love to visit any one of these markets! Oooooo! I don’t know why DoHop chose the ones they did but everything sounds amazing. I need to pick one and book a visit! Please tell me where I can buy the Coffee Truffles Moser Roth, cocoa dusted on outside,that were available at Aldi last year? They are not on shelves so far. I wish to buy at lease six boxes. Thank you.